Skin yeast infections were first discovered and classified in 1839 by German professor of medicine Johann Lukas Schoenlein. The causative fungi in that case was a dermatophyte and was later named Trichophyton schoenleinii that causes ringworm. This was the first microorganism shown to cause infection or disease in humans. 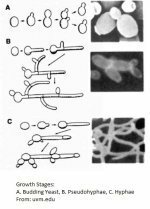 In 1925, B. Shelmire discovered skin yeast caused by candida and published his findings in Arch. Dermatol. Syph. 12. Since then these candida skin infections have been the topic of many research papers and studies. 1. Superficial infections caused by yeasts that have the ability to use keratin for food in the skin, hair, and nails. 2. Skin infections that happened because of a traumatic event and the yeasts were able to colonize the associated site. 3. Life threatening systemic yeast infections that are often seen in immunocompromised individuals. Most of these infections are caused by dermatophytes that are further classified as either Epidermophyton, Microsporum, and Trichophyton species. These yeasts are further sub-classified under these main species into approximately 40 other subspecies at this time. Most of these classified pathogenic fungi fall under the tinea subspecies. According to C. C. Kibbler; jock itch, toenail fungus, dandruff, athlete's foot, and ringworm, are most often caused by one of the dermatophytes and infect 10 to 15% of the entire worlds population. Causative factors for dermatophyte infections are most often associated with animals, especially cats, public swimming pools and public baths. In healthy individuals, candida albicans and candida tropicalis are rarely associated with skin yeast on areas of the skin that are free of hair. In these areas, candida guilliermondii and candida parapsilosis are most often the culprits. In areas where skin meets, such as the folds of the skin, or where there is high heat and moisture, candida albicans is the most prevalent infectious yeast. Skin yeast infections have been linked with elevated blood cholesterol levels. For instance when toenail fungus was treated, cholesterol levels were reduced. (British Medical Journal--1995) This of course would mean, without a doubt, the fungus contributed to the high cholesterol. Professor A.V. Costantini, former head of the WHO, in 1994 found that cholesterol binds fungal mycotoxins in the blood stream as an immune system response to these toxins. Get rid of the fungus and your body will not need the excess cholesterol. People with infections of the lungs have been found to suffer from skin yeast. Some may even resemble skin cancer. (C. C. Kibbler) Candida albicans can cause diaper rash and perleche, dry red skin or cracked skin at the corners of the mouth. Other skin diseases like psoriasis, acne, hives, and eczema don't seem to have any relation to an internal fungus infection. But when people are treated for a fungal infection that have these other skin diseases, their external skin problems often go away. There are many studies showing that psoriasis is indeed a fungal infection caused by either the fungus itself or their mycotoxins being released into the blood stream. (A.V. Costantini 1994) Psoriasis is supposedly incurable. This is just not so. The skin is the largest organ in the body. It protects your insides from the outside and more importantly keeps your insides from becoming outsides. It also can reveal many inside health problems because it does release toxins in the form of sweat from the body. Skin lesions and unexplained rashes can be early indications of a systemic internal yeast infection. These common types of skin yeast infections can affect other parts of the body as well. For example, you may have a severe case of athlete's foot and break out in a rash on the palm of your hand. The fungus did this by releasing mycotoxins into the blood stream, and the mycotoxins affected the palm of the hand. The internal problem is in most cases, preventable. Usually, it is caused by diet, antibiotics, steroids, birth control pills, or possible inhaling of fungal spores in the home through air conditioning systems. The best way to go is to take a skin scraping or biopsy and look at it under a microscope for the presence of hyphae. Care must be taken to not cut the skin when the sample is taken. To do so leaves the patient susceptible to the yeast entering the blood stream, which can result in death. Many, but not all, of the dermatophytes are fluorescent. So if you run an ultraviolet light over the infection and it glows, it's a dermatophyte fungi. However not all of these types of fungi glow under ultraviolet light so this is not a very accurate test. Cultures can also be taken and grown in a petri dish, then the growth can be examined microscopically for hyphae. Although this method is very accurate, it can quite often take one to three weeks for a large enough sample to grow. Treating skin yeast infections that are caused by the tinea subspecies of dermatophyte, can be treated by using an oral dose of 500 to 1000mgs of Griseofulvin. In severe cases, or in the event the tinea does not respond to Griseofulvin, then Terbinafine, Itraconazole, or Ketoconazole may be helpful. In many cases tinea can be treated topically with creams instead of pills. The creams that have shown good results include Haloprogin, Cyclopiroxolamine, Clotrimazole, Econazole, Miconazole, Terbinafine, Tolcicate, and Tolnaftate. You might have to try different creams to find the one that works the best. In super severe cases, a cream with a pill may be necessary. Candida yeast infections of the skin quite often respond best to Clotrimazole, Miconazole, creams containing Haloprogin, Nystatin, or one of the Imidazoles. Severe cases may require a prescription of Fluconazole, Itraconazole or Ketoconazole in addition to the cream. Below are the best natural products we have found for treating skin yeast infections naturally without the sometimes uncomfortable side effects of prescription drugs. If you suffer from any kind skin yeast disease, it may be wise to take a look at your diet. Many times allergies to foods cause intestinal dysbiosis which affects the appearance of the skin. It is also possible that the skin yeast is actually being caused by an internal yeast infection or fungal infection and their mycotoxins. For relief of the symptoms of a skin yeast, try aloe vera gel or oil of oregano diluted in olive or coconut oil. Try the mixture on an area of skin that is generally tougher than delicate areas to get the solution right so it does not burn your skin. An older class anti-fungal that is getting great results for skin yeast is Gentian Violet. Gentian Violet is a natural and safe alternative to Lotrimin and was used extensively before the advent of the azole drugs. One word of warning; Gentain Violet will stain your clothes purple. People have reported that spraying your clothes with hair spray or Zout stain remover before washing takes the stain out. Organic Coconut Oil is a superb candida yeast infection killer. Studies have found that organic coconut oil explodes the nucleus of the candida yeast cell effectively killing it. It also provides much needed relief from the itch that's often associated with candida skin yeast infections. Just rub it on the affected areas like you would any lotion. Cinnamon Oil was found to be deadly to oral thrush when applied directly to the lesions in AIDS patients. Because of this it also works very well for skin infections. You might have to dilute it like you do with oregano oil. Grapefruit seed extract in liquid form may also work. It always tests well on yeast species in the intestine so should work well for treating skin yeast. This may have to be diluted as well. The 11-Strain powder when combined with the diet on this website is showing fantastic results for unexplained skin rashes that nothing seems to solve. Some of these infections people had for years and they are going away in weeks. People are having very good luck with Terrasil Anti-Fungal Treatment MAX skin cream. Terrasil works very well for ringworm and tinea. It also helps relieve the itch and burning associated with these infections. A proprietary formula of minerals also promotes healing of the skin. This would be very good to use with the 11-strain probiotic powder. Kolorex creams active ingredient, horopito, has shown in numerous studies to be effective against candida. It can be applied directly to the infected areas. Lufenuron, commonly called cell wall suppressor or chitin synthesis inhibitor, has been medically proven to kill dermatophyte type of fungi that commonly infect the skin as various species of tinea. Tinea includes ringworm, jock itch, athletes foot, nail fungus, dandruff, and other dermatophytes. It has been used for years for dogs and cats with this type of skin yeast with very good success. Studies have been done for aspergillus and it did not work. I have not been able to find a study for Lufenuron and candida yet so I have no idea if it works for those species? Remember that skin yeast infections are quite often a sign that something is wrong inside the body. With that in mind, they should not be taken lightly. If you have any questions about skin yeast infections or yeast infections in general please visit the contact us page.